Shays Rebellion CA 8 th Grade US History Standard 8.3.5. 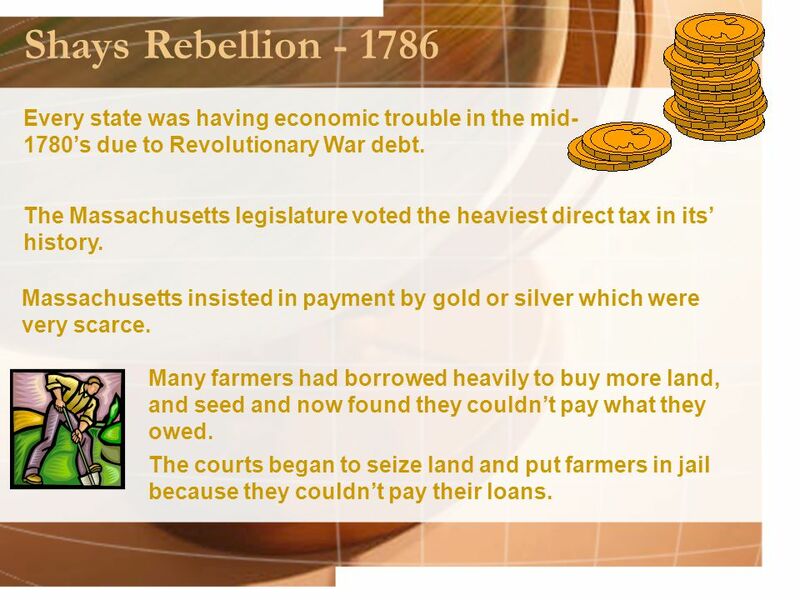 2 Shays Rebellion - 1786 The Massachusetts legislature voted the heaviest direct tax in its’ history. Every state was having economic trouble in the mid- 1780’s due to Revolutionary War debt. Massachusetts insisted in payment by gold or silver which were very scarce. The courts began to seize land and put farmers in jail because they couldn’t pay their loans. Many farmers had borrowed heavily to buy more land, and seed and now found they couldn’t pay what they owed. 3 Shays Rebellion They figured if the courts weren’t open they couldn’t keep taking away land or throwing any more farmers in jail. They were upset about paying high taxes and wanted debt relief from the government. DANIEL SHAYS lead a rebellion of about 1,500 men, mostly farmers. The government did not help them so they gathered together and marched on the courts that were taking the farmers land and sending them to debtors prison. 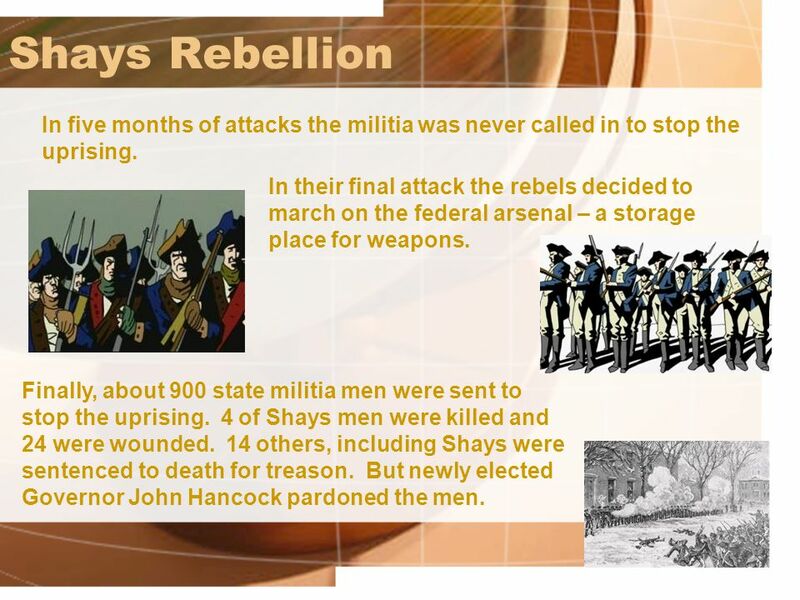 4 Shays Rebellion In five months of attacks the militia was never called in to stop the uprising. In their final attack the rebels decided to march on the federal arsenal – a storage place for weapons. Finally, about 900 state militia men were sent to stop the uprising. 4 of Shays men were killed and 24 were wounded. 14 others, including Shays were sentenced to death for treason. But newly elected Governor John Hancock pardoned the men. 5 Shays Rebellion They argued that a strong national government was needed to settle this kind of dispute. The Federalist’s used Shay’s rebellion as an example of civil unrest. Massachusetts was very close to chaos because of taxes. 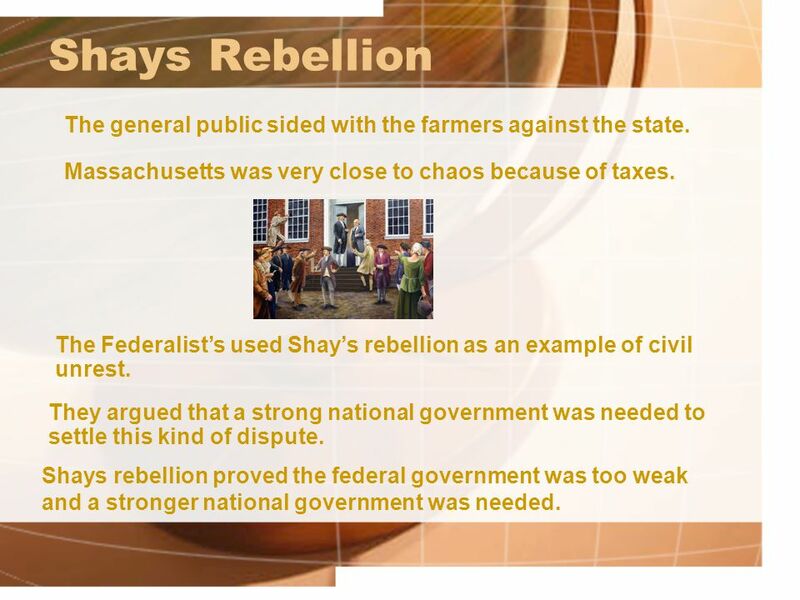 Shays rebellion proved the federal government was too weak and a stronger national government was needed. The general public sided with the farmers against the state. 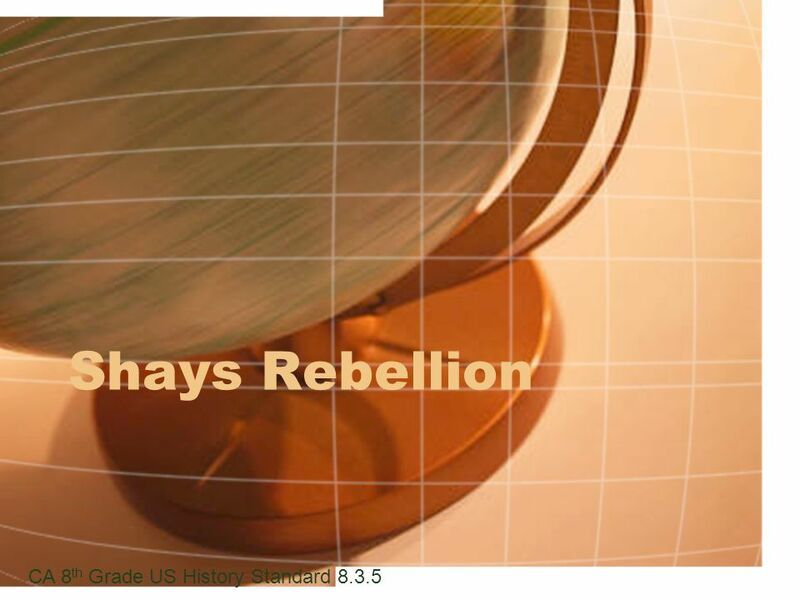 Download ppt "Shays Rebellion CA 8 th Grade US History Standard 8.3.5." The Confederation Era The war is over, now what? America was now and independent nation having won the Revolutionary War, but now what? What would the. Why were the Articles of Confederation so unsuccessful? The Confederation Era. America was now and independent nation having won the Revolutionary War, but now what? What would the country and the government. Do Now  Brainstorm what type of government you would want to put in place in 1776  Imagine you’re from that time  Strong or weak government?  Democracy? Forming a New Nation Creating a new Government The beginnings of US government Magna Carta: this document limited the power of the monarchy. It established. What were the long-term problems with the Articles of Confederation? The United States gained a huge new area after the Revolutionary War Now had to decide how to divide it up into existing states or new ones. TAKE OUT YOUR INB Turn to the page after the notes from yesterday about the Articles of Confederation Turn to the page after the notes from yesterday about. Essential Question: What were the long-term problems with the Articles of Confederation? CPUSH Agenda for Unit 3.1: Clicker Preview Questions Articles. The Articles of Confederation. The Articles were written in 1777…..right smack- dab in the middle of the Revolutionary War! The Articles were written. Chapter 10 Lesson 1.  Confederation – an alliance, league, the thing formed when a group bands together or unites.  Articles – distinct, numbered, non-fiction. 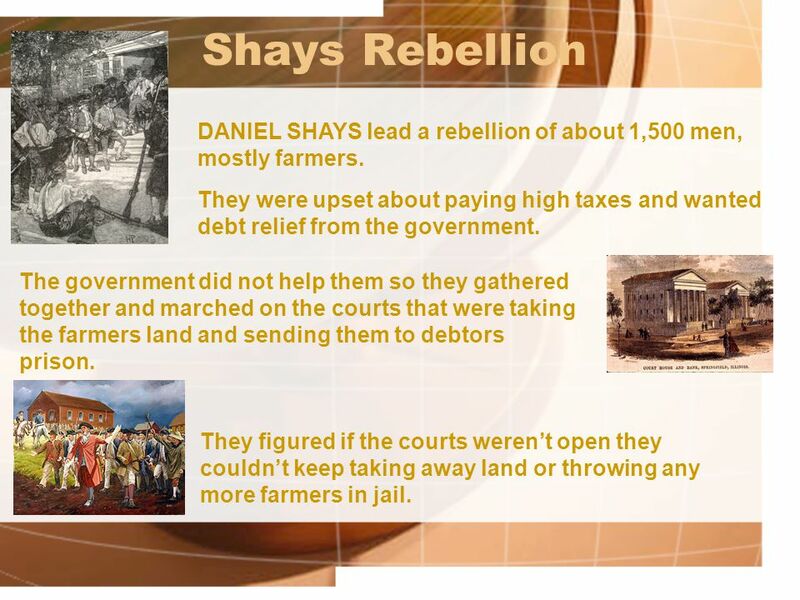 Shays' Rebellion. By the 1780s the United States faced many problems operating under the Articles of Confederation. Massachusetts farmers were outraged. Warm-up #6 Create a t-chart showing the strengths and weaknesses of the Articles of Confederation. (Use your reading and Cornell Notes to complete this. After the Revolutionary War…. 2 The country is a mess… States were not united National Government = Broke No Army! And all because of our nation’s 1 st.